* If you prefer, you can see a .pdf version here (2.87 Mb). 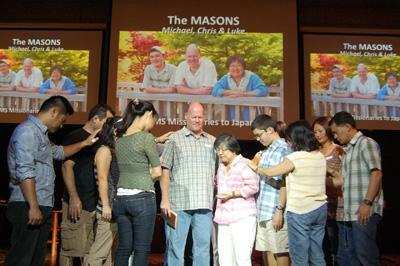 It has almost been one month since we returned to Japan from our nine weeks of home ministry in the States. Although the summer already seems like a distant memory, we look back upon our time with much thankfulness in our hearts. The main purpose of visiting the States was to visit our supporting churches. Since it had been 3 years since we were home last, and 5 years since we had been able to visit some of the churches, we felt that it was important to connect with as many of the churches as possible. The good news is that we were able to visit all nine of our Southern California churches on Sunday morning, as well as meet with the mission committee of our church in Spokane, WA. It was a privilege to be able to share about the wonderful journey that God has taken Oasis Church on (formerly Sakai International Bible Church) over the last two years, as He has led us to a more simple way of gathering together in a church member’s home. Honestly, we were a bit worried about how people might react to the somewhat “radical” transition the church has gone through, but we were overwhelmed by the support and affirmation that we received from the various churches. It was a huge blessing to know that others could see God at work in this small group of believers. We are so grateful to all of the churches for their partnership and support of the ministry in Japan, and for their willingness to let us share a bit about what God is doing here. Besides visiting our supporting churches, we also had many opportunities to reconnect with family and friends. Clearly, one of the hardest parts about living overseas is being separated from the people we love. E-mail, Skype and Facebook are wonderful ways to keep in touch, but nothing beats sharing a meal (preferably Mexican food!) with old friends. So, while we are thankful for the many people we were able to see this summer, we also regret that we didn’t have more time. Nine weeks is just too short to try and connect with all of the people we wanted to see. Well...maybe next time. One of the highlights of the summer was being at Gardena Valley Baptist Church on the day that Chris’ mother was baptized! Since we missed her father’s baptism a few years ago, it was nice that we could be around for this special day. 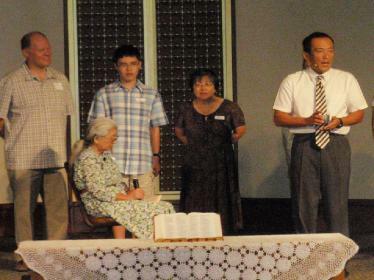 We are thankful for our many friends and the wonderful Japanese congregation at GVBC who have taken the time to reach out to Chris’ folks with the wonderful love of Jesus. 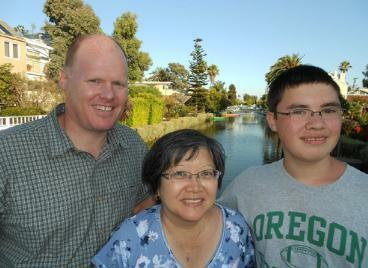 We ask that you would PLEASE PRAY for Chris’ parents. May they continue to grow in simple faith, and may God give them a “spirit of wisdom and revelation, that they may know Jesus more” (Ephesians 1:17). Thank you. While we were home this summer, we discovered that the funds in our reserve account at JEMS were dangerously low. These funds are used as a buffer during those months when not enough support comes in to meet our monthly salary. However, the gradual decrease in giving during recent years has nearly depleted the reserves in this account. This means that in those months when giving is low, we will not be able to receive our full salary from JEMS. So, after adjusting our budget and taking a salary cut with JEMS, we still need to increase our current level of support by an additional $300-$500 a month. On the one hand, this seems like a large amount to raise. But on the other hand, if it is God’s will that we continue to serve in Japan, we know that He will provide for this need. God has been faithful to us during these last 17 years, and we have no reason to doubt His provision now. However, we also don’t want to take His provision for granted. Jesus teaches us to ask our Father for our “daily bread,” and so we know that He wants us to bring this need to Him in prayer. And so, if you could PLEASE JOIN US IN PRAYER for this special need, we would very much appreciate that. Thank you. Chris is back into school mode at Kansai Christian School. PLEASE CONTINUE TO PRAY for her as she teaches the 5th-6th Bible class and serves as a teacher’s aide to the 1st-2nd grade class. The Fall is usually a busy time for the KCS teachers as both the all-school sports day and the all-school campout are held in mid October. Please pray for the physical energy for Chris to make it through these first two months. Oh ya, Chris was also recently elected the PTA president for the school year. Michael will continue to devote much of his time to serving at Oasis Church. PLEASE PRAY for him as he provides leadership for the church family, as we all learn how to be fully devoted disciples of Jesus. May the church not only grow closer to Jesus as we gather together each week, but may the Lord also give us a growing heart to reach out to others and make an impact on our communities for the Kingdom of God.